NORTH PROVIDENCE EDITION | VALLEY BREEZE | JUNE 13-19, 2018 NORTH PROVIDENCE 19 BREEZE PHOTOS BY BILL MURPHY PAISLEY CANHAN, 4, left, of Lincoln, and her brother MASON CAROLEMEAS, 8, ride The Dragon at the Saint Anthony Church Feast. 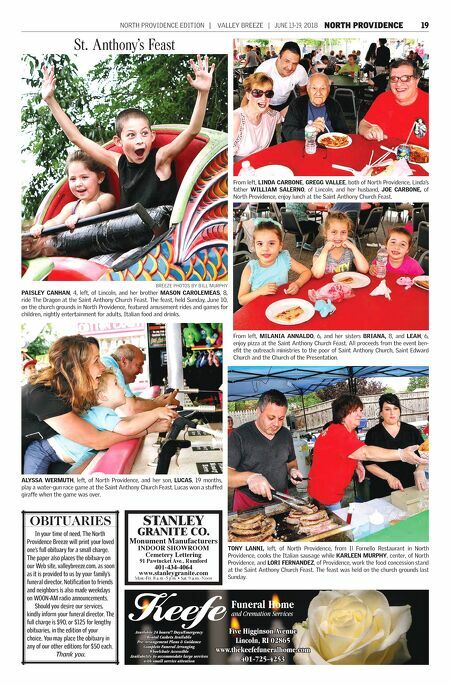 The feast, held Sunday, June 10, on the church grounds in North Providence, featured amusement rides and games for children, nightly entertainment for adults, Italian food and drinks. From left, LINDA CARBONE, GREGG VALLEE, both of North Providence, Linda's father WILLIAM SALERNO, of Lincoln, and her husband, JOE CARBONE, of North Providence, enjoy lunch at the Saint Anthony Church Feast. From left, MILANIA ANNALDO, 6, and her sisters BRIANA, 8, and LEAH, 6, enjoy pizza at the Saint Anthony Church Feast. All proceeds from the event ben- efit the outreach ministries to the poor of Saint Anthony Church, Saint Edward Church and the Church of the Presentation. ALYSSA WERMUTH, left, of North Providence, and her son, LUCAS, 19 months, play a water-gun race game at the Saint Anthony Church Feast. Lucas won a stuffed giraffe when the game was over. TONY LANNI, left, of North Providence, from Il Fornello Restaurant in North Providence, cooks the Italian sausage while KARLEEN MURPHY, center, of North Providence, and LORI FERNANDEZ, of Providence, work the food concession stand at the Saint Anthony Church Feast. The feast was held on the church grounds last Sunday. St. Anthony's Feast In your time of need, The North Providence Breeze will print your loved one's full obituary for a small charge. 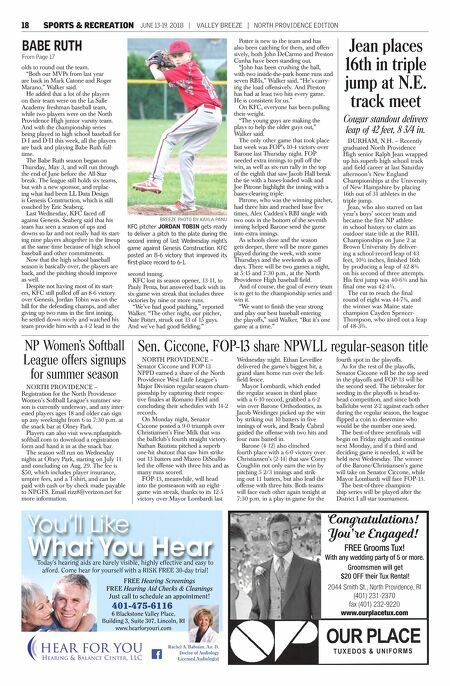 The paper also places the obituary on our Web site, valleybreeze.com, as soon as it is provided to us by your family's funeral director. Notification to friends and neighbors is also made weekdays on WOON-AM radio announcements. Should you desire our services, kindly inform your funeral director. The full charge is $90, or $125 for lengthy obituaries, in the edition of your choice. You may place the obituary in any of our other editions for $50 each. Thank you. OBITUARIES Keefe Funeral Home and Cremation Services Available 24 hours/7 Days/Emergency Rental Caskets Available Pre-Arrangement Plans & Guidance Complete Funeral Arranging Wheelchair Accessible Availability to accommodate large services with small service attention Five Higginson Avenue Lincoln, RI 02865 www.thekeefefuneralhome.com 401-725-4253 Monument Manufacturers INDOOR SHOWROOM Cemetery Lettering 91 Pawtucket Ave., Rumford 401-434-4064 www.stanleygranite.com Mon.-Fri. 8 a.m.-5 p.m. • Sat. 9 a.m.-Noon STANLEY GRANITE CO.